It is so much fun keeping up with the big bucks that I have gotten whitetail pictures of this year. All year I have been getting a lot of whitetail pictures. I got a lot of whitetail pictures of this buck we named Fat Albert. I got a ton of whitetail pictures this year, this is a buck we named Fat Albert. It will be interesting to see what he looks like next year if we are lucky enough to have him hang around. I can’t wait to see what this big whitetail looks like next year. He is one of my favorite bucks that I got photos of just because he was so fat(we named him “Fat Albert”) and has a freak nasty rack with lots of character. I’m not so sure I would have shot him because he wouldn’t have scored that well but he has been fun to watch all year long and I hope he sticks around for next year. Getting trail cameras pictures all year long has become a big part of this website and is truly addicting. This year I was fortunate enough to have several really nice bucks hanging around my deer hunting areas to give me some wonderful trail camera pictures to share with you on here. Do you have a favorite whitetail? Trail camera pictures Tall Tine. Even if he’s not the big one, just one that you have grown to know and watch grow throughout the years? I had a very nice 9 pointer that we named ” The Tall Tine 9″ that I was getting tons of photos of all the way up until muzzle-loader season and when “Fat Albert” showed up “The Tall Tine 9” disappeared and hasn’t been seen since. I don’t know if someone shot him or if the older buck ran him off. I thinking someone shot him but you never know. He may show up later, but I doubt it. What is the longest you have had a buck disappear for only to show up at a later date? I sure hope “The Tall Tine 9” shows up again. He was a very nice buck with a lot of potential for being a very nice trophy buck this upcoming season. I really wanted to see what he would look like this season. Oh well that is why I keep running my cameras year round for the excitement of not knowing what will be on that SD card when I pop it in my computer. Like my good friend and fellow DHBB Pro-staff member Troy said the other day it’s almost like Christmas every time you check those photos. I am pumped that it will be time to go shed hunting soon. I can’t wait to get out and beat the bushes looking for those big boys antlers. I hope to find some monster sheds this year. If you find any send us some pictures and we’ll share them on here if you would like us to. I hope you all had wonderful holiday season and a great new year. 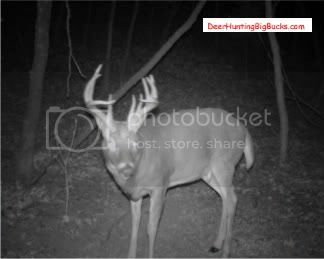 And I wanted to thank you for visiting DeerHuntingBigBucks.com from time to time. If you would like to contact us with questions or to share a story or photos feel free to reach us by our contact form. 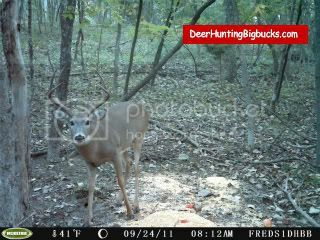 Tagged trail camera pictures Tall Tine, whitetail pictures. Bookmark the permalink. Trail cameras help me take an inventory of bucks that made it through the season.